WASHINGTON, March 11, 2015 – According to a group of international researchers in plant genetics, what lies between the current state of wheat breeding and the elusive wheat genome sequence is about $13 million. Wheat is the last major commodity crop waiting for a blueprint of the many chemical building blocks that make up the DNA of each chromosome. Unlocking the sequence of these building blocks will allow breeders to identify the gene’s underlying traits like yield and stress tolerance. Obstacles include the complicated nature of the bread wheat genome, as well as insufficient funding. According to the International Wheat Genome Sequencing Consortium (IWGSC), the completion of the wheat genome reference sequence is essential to accelerate wheat breeding. “It holds the key to the production of a new generation of wheat varieties through genomic selection,” the consortium states. Kick-started by the Kansas Association of Wheat Growers, the IWGSC, which began its work in 2005 and includes almost 1,500 members in 63 countries, became one of 10 Expert Working Groups of the global Wheat Initiative in 2013. The bread wheat genome, because of its compound nature, is regarded as five times more complex than the human genome. It is composed of six sets of chromosomes and known as a hexaploid. The human genome, with two sets of chromosomes, is a diploid, as is the rice genome, sequenced in 2000 and recognized as 37 times smaller than the wheat genome. 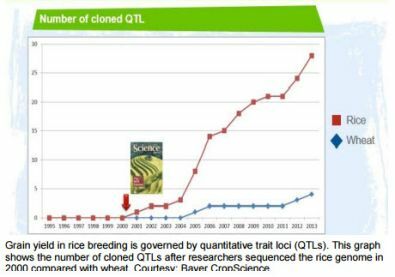 The ease of identifying and cloning important genes in rice increased significantly after researchers sequenced its genome. Being able to clone certain genes is significant for any agricultural crop, noted Kellye Eversole, the IWGSC’s executive director. “You cannot do that efficiently without a high quality genome sequence,” she said in an interview with Agri-Pulse. The IWGSC has secured approximately $54 million in funding for the wheat genome project. Eversole estimated that a further $12-13 million in dedicated resources is required to complete the map and sequencing assembly. In the meantime, wheat is facing increasing competition for acres. According to USDA’s Economic Research Service, U.S. wheat harvested area has dropped off nearly 30 million acres, or nearly a third, from its peak in 1981 because of declining returns compared to other crops. Still, wheat ranks third among U.S. field crops in both planted acreage (56.8 million acres this year) and gross farm receipts, behind corn and soybeans. As Bayer CropScience notes, wheat yields have continuously risen in the past decades, but the rate of increase is being out-stripped by rising demand. The fact that wheat provides 20 percent of the global population’s daily protein and calories makes increasing the crop’s yield and strength vital for meeting future demands. With a world population of 9 billion in 2050 (up from just over 7 billion now), wheat demand is expected to increase by 70 percent. To meet that demand, annual yield increases must grow from the current level of below 1 percent to at least 1.7 percent, according to the Wheat Initiative. IWGSC’s goal is to achieve a reference genome – a representative example of a species’ set of genes – by the end of 2017. Of the 21 chromosomes the consortium needs to map and sequence for wheat, one, the 3B chromosome, is fully complete. Last summer, the journal Science published IWGSC’s full, high quality, map-based sequence of the 3B chromosome, which is larger than the entire rice genome. In addition, IWGSC published a draft “whole shotgun” sequence of the entire wheat genome, which is about 53 percent accurate, Eversole said. Whole shotgun sequencing is one of two ways to sequence a genome. It allows the job to be done quickly – in a year or less – but can be highly inaccurate. The “map-based” approach takes much longer but is more precise. Due to its highly complex genome, researchers need bread wheat to be sequenced through the map-based approach. Following the success of 3B, which she said is 94 percent accurate, the map-based sequencing approach is now being applied by groups across the world to other chromosomes. In total, 23 laboratories from 15 different countries are engaged in the project, according to IWSGC. Catherine Feuillet, the head of trait research at Bayer CropScience and a co-chair of IWGSC, said the sequence could help improve conventional breeding as well as GM wheat. Sequencing the genome will help reveal which course is best for wheat production. In 2013-2014, Bayer Crop Science contributed over $1 million to the wheat genome project. Eversole confirmed that this is the largest contribution from any private industry partner. Beyond contributing to the genome sequence, Bayer has a 10-year plan to invest $1.9 billion in wheat research and development through 2020. As for the remaining $12-13 million in funding? Eversole says she’s hopeful and that the consortium is focused on France and Germany, as well as the EU as a whole.